Baby is developing fast now, so create lots of opportunities to safely explore and discover. Have a look at some of the ideas on these pages. You don’t need to be constantly involved – just being around is enough. 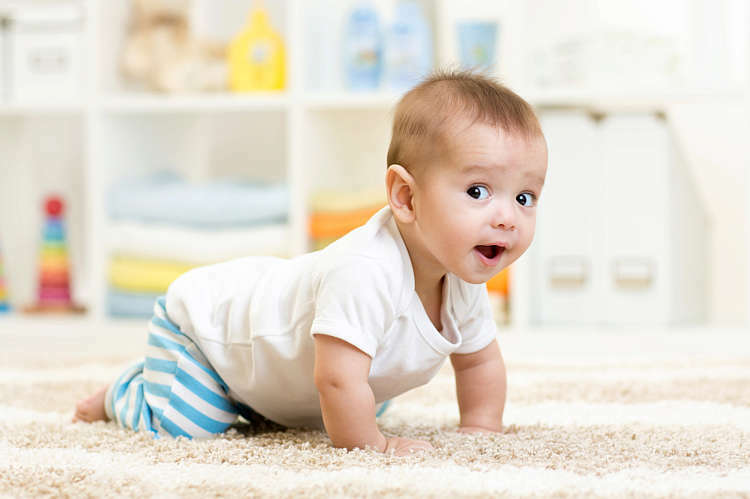 Baby may already be beginning to crawl, but there is no “normal” time to start crawling so don’t worry. As baby begins to move around, make sure your home is safe. You’ll find plenty of useful tips in this section. Remove obvious risks and keep soothers and toys as clean as possible. Meal times will also become more interesting. 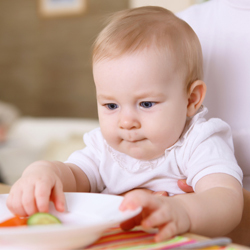 Add variety to the menu and involve baby in the regular family eating rituals. And don’t forget mum’s needs! 30 minutes enjoying a cosy candlelit bath or a relaxing massage can make all the difference. Another fun thing to do is to make mementos out of baby’s first clothes, teethers or toys. We have lots of fun ideas for you. Create free space for children's own ideas! Babies develop incredibly quickly. You will be amazed how quickly your tiny little baby turns into an independent little child. 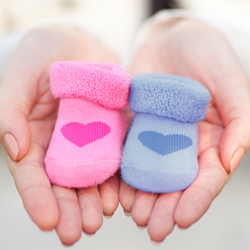 Enjoy this exciting time and try to be there for your baby as much as you can. For it is only by having support and trusting their parents that children learn to express themselves and follow their own paths. Spending time with babies does not just mean actively engaging with them – simply "being there" is also a vital part of this. It is therefore neither necessary nor beneficial to constantly talk to babies, play with them or have them sit on your lap. You can also be completely there for your child by quietly observing them or simply positioning yourself close to them. You will then give your baby the reassurance that they are not alone and at the same time encourage them to develop the skill of occupying themselves. By contrast, constant holding or playing games often leads to "dependency". The child demands more and more of this and quickly gets bored as soon as the usual level of attention is lacking. Hang up mobiles: Make mobiles from colourfully plastered cardboard boxes or household objects – make sure you affix them at "reaching height" so that the objects cannot get into the mouth! Make your own toys: Create something a bit different, e.g. with colourful rattles made from plastic bottles (filled with sand or lentils) or dolls made from leftover fabrics. "Baby-friendly" environment: Make sure that all objects within baby's reach are also really suitable for babies. 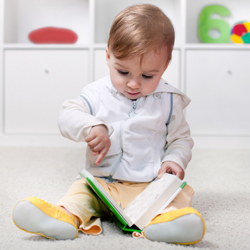 Less is more: Do not overwhelm your baby with toys! If there are too many things to take in, your child will quickly feel overwhelmed and lose interest in exploring things. Demonstrate instead of explaining: Particularly in their first year, babies only learn through imitation, not through explanations. If your child is unsure, simply demonstrate to them how they can play with objects. After months of scrabbling around and trying to reach out for things, the next major change is just around the corner: The child is finally able to see much more of their environment while sitting down. The next big target is to be able to stay standing up, but this will require a bit of practice as the baby's sense of balance is used to a lying-down position. Still, if the toy the baby wants is in the other corner of the room, the baby needs to get there somehow! And so begins – with some children at an early stage, with others a little later – all the fun of crawling. 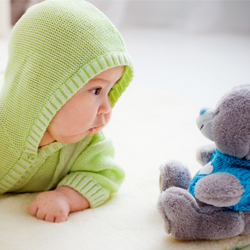 Other people hold a special fascination – the baby likes to join in with social situations as much as possible. And even if you can't understand a word, the baby understands much more than you'd think. The baby's own name, Mummy, Daddy and the most important toy are already firmly established in the baby's own little world, and with a little practice one day words will flow from the mouth of the little linguistic enthusiast. 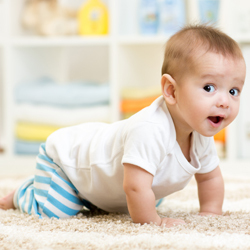 Whether they're rolling around, sliding, crawling or on all fours, babies on the move like to explore. But almost everything that they find exciting is delicate or dangerous. And needs to be moved out of sight and reach in good time. The MAM Safety Check draws parents' attention to everything that can become a risk factor for children – right through to poisonous snowdrops in the garden. Despite the need to protect the baby, you shouldn't completely stop his desire to explore and discover new things. The trick is to provide discovery areas which do not present any hazards. Place indestructible plastic crockery in the bottom drawers which can happily be emptied. How children get to grips with their world. Babies are curious from the day they are born – little explorers that want to try everything out and literally get to grips with things themselves. This gets particularly exciting when their little hands are finally skilled enough to deliberately grasp, throw or drop objects. An experiment that in children's eyes cannot be repeated often enough! But it is not always possible for Mummy and Daddy to share this enthusiasm. Particularly when the missiles thrown consist of baby's dinner or toys which are flung in a big arc through the living room. Directing children's curiosity down the right channels. Even if it might sometimes appear so, when children throw and drop objects they do not do so with any ill intent. It is much more a case of their own fascination with this new-found skill that they want to practise all day long. If you then go over to pick up the object that has been thrown, the experiment is transformed into a game that the two of you can play together. Your baby will thus be motivated to continue the game! At dinner time, it is therefore helpful to place your child on the floor as soon as they start throwing down food from their high chair. As a general rule, the "desire to throw" only surfaces once your child is already full. So take away their plate as soon as the first missiles begin to land on the floor. And one more tip: To make sure that at least baby's soother always remains where it belongs, simply attach it to baby's clothing using the practical MAM Clip. This will ensure that it remains clean and to hand at all times even on active days! Granted, sometimes the spinach ends up on the wall. That’s just a part of it all. In general though, a balanced diet can go together with the joy of eating. Nutrients, calories and vitamins don’t interest babies at all and they don’t matter to talkative children either. Eating is mostly about fun. Eating is an enjoyable family ritual. Talk to the baby, maintain eye contact, encouragement to try new things makes everyone at the table happier and helps with learning. Quantity concerns are unnecessary: A healthy child has (unlike most adults, by the way) a functioning hunger - fullness mechanism. It eats as much as it needs and knows when it has had enough. Therefore, one should not be over encouraging or try to force the child to eat. A sensible diet should be natural and pleasant - not made of compulsions and prohibitions. To not like a meal or empty the plate once is completely okay. The “Pizza-Tactic”: kid favourites like pizza or chips shouldn’t be completely stricken from the menu plan. Instead, it’s better to combine these with healthy foods. Food is neither punishment nor reward. Additionally, some traditional patterns of upbringing often end up in the wrong nutritional direction: The well-known adage “A spoon for mama, a spoon for papa...” does not promote healthy development. Rather, obesity for the future. Snacks like colourful fruit can and should be allowed. When children take food in their hand most parents are completely unsure: Allow? Forbid? Developmental pedagogues consider this playing to be highly valuable since it trains the motor skills and senses. This brings about a compromise: Allow a short time to pass, to enjoy the feeling and consistency, preferably away from the dinner table where making a mess won’t be a problem, but at the same time making it clear that eating at the table has its own, clean rules. Exhausting day with the baby? Worn out in the evening? 30 minutes of dedicated pampering can work wonders! As the baby becomes increasingly chirpy, relaxation, rest and pampering become twice as important for parents so that they can recharge their batteries for the next action-packed day with their baby. Relax with essential oils: Lavendar and camomile are the best way to improve your mood. Tip: Mums who are breastfeeding should add the oil to an aroma lamp instead of the water in the bath and then ventilate the room – this is because babies like it best when Mummy smells only of Mummy. Candlelight mood: A few candles on the edge of the bath create soothing lighting. The perfect recipe for a relaxing bath: Make sure the water temperature is no more than 38 degrees, spend 15 minutes in the bath, then have a hot shower. Finally, you should briefly rinse your calves with cold water. This stimulates circulation and is good for the connective tissue. Fancy reading a newspaper? There is plenty of time for this in the bath. Massage: Is your partner home? Great! A 10-minute head, foot or back massage is great for your body – and for your relationship. Time for pampering: After a bath or shower, skin is particularly receptive to nutrients. Rub plenty of cream onto the body and apply a cleansing or relaxing mask. Grown again? It's time to move on to the next clothing size! And cute little socks, T-shirts and accessories can be transformed into a decorative object. In the first few weeks of their lives, babies gain around half a kilo in weight each month and they grow out of their things incredibly fast. But the cutest items don't just have to be consigned to the wardrobe or the second-hand shop – they can offer a real artistic benefit.